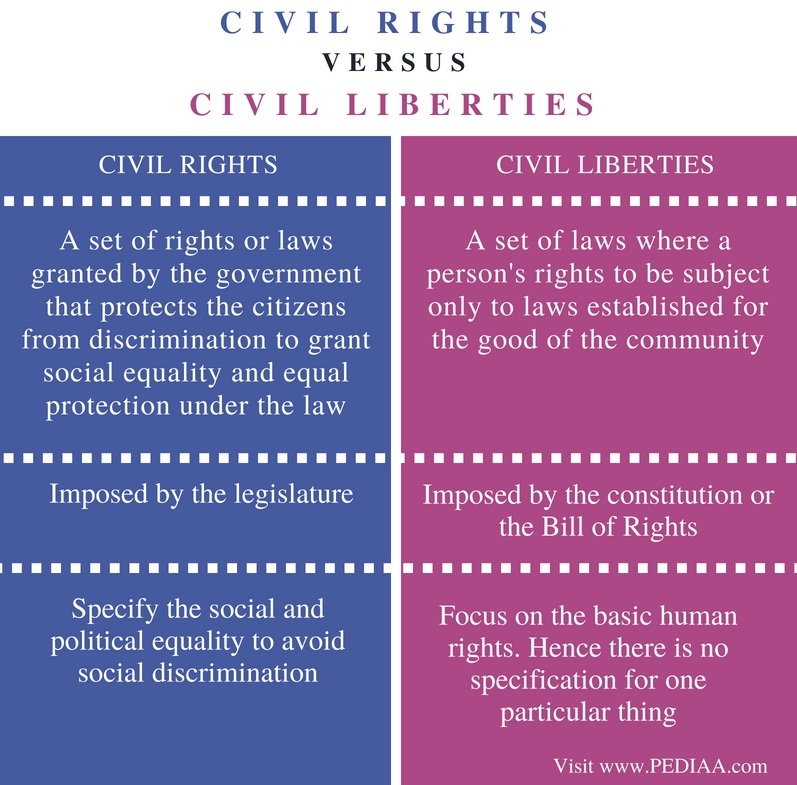 The main difference between Civil Rights and Civil Liberties is that civil rights focus on granting equality to individuals so as to avoid discrimination while civil liberties involve basic human rights without any specification. Civil rights and civil liberties are terms that are often used as synonyms, but the terms have very distinct differences. Civil Rights refer to a set of rights or laws granted by the government that protects the citizens from discrimination to grant social equality and equal protection under the law. Civil Liberties refer to a set of laws where person’s rights to be subject only to laws established for the good of the community. Civil rights refer to a set of rights granted by the government to protect its citizens by guaranteeing social equality and equal protection under the law. Thus, it emphasizes on avoiding discrimination to individuals irrespective of their social status, gender, race, religion and other personality traits. Therefore, Civil rights concern the basic right to be free from unequal treatment for people who were traditionally discriminated against on the basis of some group characteristics (race, gender, disability, etc.) and to grant them equal rights in settings such as employment, education, housing, and access to public facilities. In brief, it is the rights of every citizen to enjoy the political and social freedom and equality. The federal government establishes most civil rights laws via federal legislation or case law such as from the particular Acts namely; Age Discrimination Act, Civil Rights Act, Fair Housing Act etc. Moreover, Civil rights are an essential component of democracy. Thus they are secured by positive government action, often in the form of legislation. Civil liberties are the basic human rights granted by the state to its citizens without any further specialty. 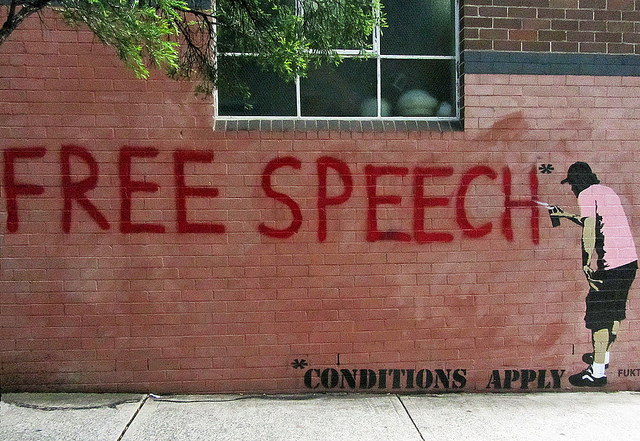 Civil liberties highlight the individual’s state of being subject only to laws established for the good of the community, especially about freedom of action and speech. Civil liberties concern basic rights and freedoms that are guaranteed – either explicitly identified in the Bill of Rights and the Constitution, or interpreted or inferred through the years by legislatures or the courts. Even though at a glance, both these rights appear to address the same issues, the way to distinguish between these two is by looking at what right and whose right is affected. As an example, discriminating someone from enjoying a public facility based on that person’s race or gender is a civil rights issue, not a civil liberties issue. Both kinds of rights emphasize providing protection and equity to the life of citizens. Civil Rights refer to a set of rights or laws granted by the government that protects the citizens from discrimination to grant social equality and equal protection under the law. Civil Liberties refer to a set of laws where person’s rights to be subject only to laws established for the good of the community. Civil Rights are imposed by the legislature while civil liberties are imposed by the constitution or the Bill of Rights. Civil rights specify the social and political equality to avoid social discrimination. Civil liberties, on the other hand, focus on the basic human rights. Hence, there is no specification for one particular thing. The two terms civil rights and civil liberties are often used interchangeably by many, which is wrong. Nevertheless, both Civil rights and Civil liberties are sets of rights enjoyed by the citizens of a state. Unlike civil rights that specify on highlighting to impose rights in order to avoid unwanted discrimination, civil liberties are the general rights any individual can enjoy as a citizen of a country. This is the difference between civil rights and civil liberties. 1.“What Are Civil Rights?” Findlaw, Available here. 2. Hamlin, Rebecca. “Civil Rights.” Encyclopædia Britannica, Encyclopædia Britannica, Inc., 8 Sept. 2017, Available here. 3. “What Are Civil Rights?” National Parks Service, U.S. Department of the Interior, Available here. 4. “Civil Liberty.” Encyclopædia Britannica, Encyclopædia Britannica, Inc., 11 Aug. 2016, Available here.